Recently I’ve been looking at my groaning shelves and thinking I’ve got a fair amount of games, I have access to twice (since being provided as part of PlayStation Plus). Once via shiny disc or diddy carts in plastics boxes with cover art and also sat on my PlayStation Network Download list. As a games collector I personally prefer physical media for a couple of reasons. I only have a 320gb HDD in my PS3 and a 16gb PS Vita memory card, so having discs and cards means I don’t have to sacrifice digital space if I fancy playing something. My Internet connection is also not the quickest of data pipes, so if I did just fancy a quick blast on something, I can simply pop the disc in the drive and I’m gaming. I take pride in my games on display for fellow gamers to peruse or borrow if they would like. With another gaming generation rapidly approaching, a requirement to clear some space on my selves for new software, as well as the major benefits of being A PS+ subscriber as brilliantly put by Darren HERE! Having never traded before due to high depreciation value, out of curiosity I downloaded GAME Reward Mobile App and fired up the conveniently included Barcode Scanner functionality for Trade In’s. I discovered that twelve top titles were worth a meagre £68 trade in for store credit, but substantially less for cold hard currency. What I didn’t realise was that GAME also gives Reward Card Points for trading games in based on their trade in value. Thanks to some interesting responses from telling me to look around to see if I could get a better deal. Many suggestions were given from looking at eBay prices, other game store trade ins, or Amazon. What really caught my attention was what @chalky83 said about price matching. His suggestions required a little bit of extra work, so off to cex.co.uk website to check the value they offer which is actually better. Checking the same games and adding them into a sell list was actually loads simpler than I expected giving me a total of £87 cash or £116 voucher. I can tell you as someone who doesn’t trade that £29 appeared to be a huge difference in value. 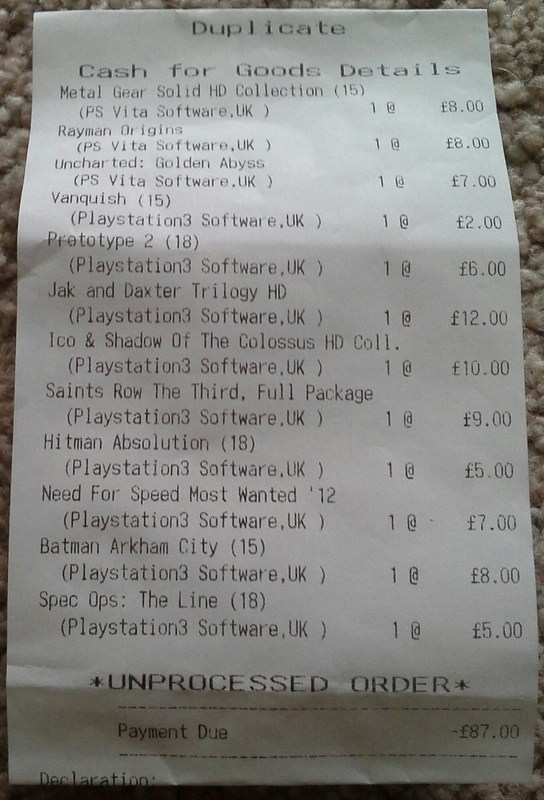 So just by doing a little research my haul was worth £48 more of in credit store than Game’s App suggested. So on Sunday afternoon off I toddled down to @GAMEHullSuper with my games under my arm and hope in my heart for some trade in goodness. I asked the sales assistant how I would go about trading and if they price matched. He explained that they required a receipt showing the value CEX would give for cash or In store vouchers. I explained that I had the details on my phone but he explained they needed a physical receipt. Seems a bit antiquated in this age of mobile broadband and smartphones but it’s their rules. So across the Mall I went to CEX where the sales assistant scanned my games getting stuck at Ico & Shadow of the Colossus HD Collection, which wouldn’t scan. I told her it was a US import, which she said shouldn’t be a problem. After she searched their website and back on to her system she located it. I asked for a receipt and returned to @GAMEHullSuper with my piece of paper and bag of potential future software funding stash. The sales assistant proceeded to check them on system, stating which ones he would match and which they already beat. In order to trade he needed to get his manager to enter a pin to acknowledge the price match on each item. Again that Ico & Shadow of the Colossus HD Collection wouldn’t scan due to it’s Stateside origins. The total he quoted was £86, which seemed odd as CEX had stated £116 voucher price (the same as shown on their site) and Game‘s sales assistant stated they would match. Upon inspection of the CEX receipt, my Noob status it as a games trader became apparent, due to the fact that she had provided me a receipt for cash value only. The GAME’s sales assistant and manager restated the requirement for physical proof. I said I could head back to CEX or the manager could use the above displayed screen grab from www.cex.co.uk. The Manager stated that screen grabs could be altered digitally, to which I explained I neither had the skills or inclination to Photoshop said screen grab. Thankfully this guy had a great understanding of customer service and obviously twigged that there would be potential for a loss of cheap secondhand good quality stock and future purchases. It was running through my mind that I would just return to CEX and get the vouchers, but the Manager used my screen grab from my phone and re-input all the items again. 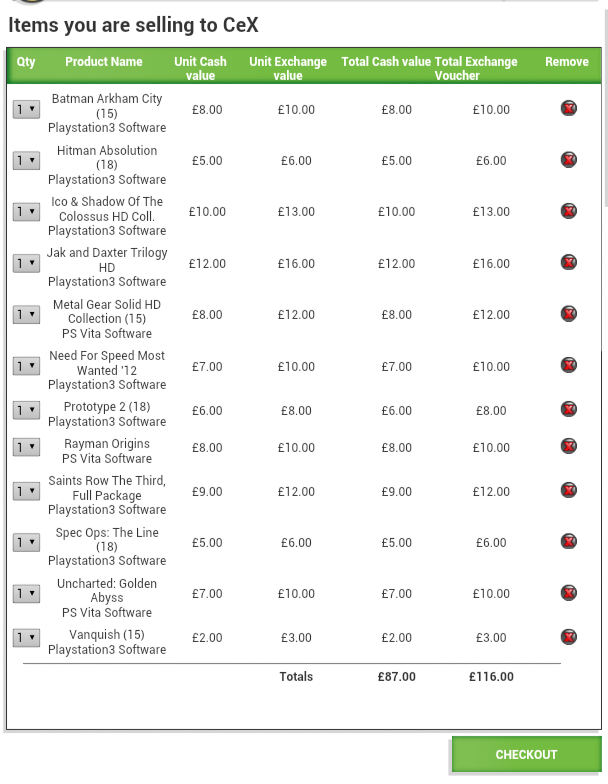 Giving me the same total as CEX minus the £12 CEX were offering for the American copy of Ico & Shadow of the Colossus HD Collection. So he added the amount of £104 to a gift card. Which will go nicely towards Killzone: Mercenary on PSVita out on 6th September and Beyond: Two Souls due in October, which I pre-ordered in direct contradiction to THIS. To sum up the experience I did feel a little out of my depth and slightly dirty breaking up by game collection for a fraction of these games original cost, but I can easily use the cash to expand my games collection with other releases and I do technically already have them if I ever want to download them. It did require a bit of faffing around which I feel was a little unnecessary but the staff were helpful and friendly. It’s made me hopeful of the Offer Game have announced today about Trading up from current generation to the next generation on selected titles until “24/12/12 IN STORES ONLY” (sic). With Sony’s future unknown with regards to how Gaikai will be implement for the current Sony systems but confirmation that they will be supporting the “Best PS3 titles” via “streaming to PS4, in American from Early 2014” and on “PS3 and PS Vita to follow” it appears our discussions about no longer owning content may well be coming true. I also predict that you will have access to any supported titles you have download during your PS+ subscription to play via streaming as part of PS+. There are certainly some amazing PS3 games I would love to play on my beloved PS Vita and earn trophies for them. Do your research! – Check out who’s offering the best deal. Bear in mind that most places offer more for in store credit than cash. You will also likely get more cash by selling to friends or relatives or if you’re willing to take a chance on auction sites. Get your games together – Makes sure they’re in good condition with instructions. 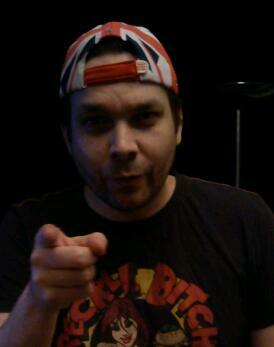 Be warned some Collector’s Editions are actually worth less than standard versions, strange but true. Check the region of your game – You can usually identify if they are from another region due to Region codes or alternative Ratings on them, these can sometimes be covered with a your own territory sticker. Make sure that the store you’re wanting to trade with will accept them. Prove yourself – If you’re trading in for cash make sure you’ve got ID as legally stores can’t give cash for games unless they can prove who you are. ie old enough to be selling games rated 18. Trade to save – if you trade close to release of the game you are likely to get a far higher value than waiting 6 months to a couple of years. Our very own Platinum Stig uses this method for keeping his trophy addiction going. Generally PS+ only gives you games after they’ve been on retail for at least 6 months. If you know that something is going to be added then the sooner you trade the more you’ll make. Be polite – Sales assistants are people too, be courteous they’re only trying to make a living, and are generally gamers themselves. Please note the amount shown in this article were accurate on 30th August 2013 and may not be the same now.